This quick and easy meat-free risotto is perfect for a mid-week supper or when cooking for two. It also looks and tastes fabulous. 1. Heat the olive spread in a large saucepan, add the onion and cook gently for 5 minutes until softened. 2. Meanwhile, heat the stock and 100ml water in a small pan with half the grated beetroot. Cover and keep warm. 3. Add the garlic to the onion pan and cook for a further minute, then stir in the rice. Cook for a minute, stirring until the rice is coated in the butter, then pour over the wine and allow it to sizzle and reduce. 4. Gradually add the hot stock, a ladleful at a time. Stir well and allow the stock to be absorbed by the rice before adding the next ladleful. 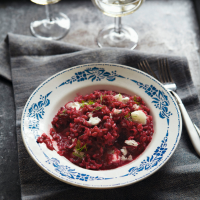 When you’ve added almost all the stock, fold through the rest of the beetroot and continue to cook until you have a soft and creamy risotto. 5. Stir through the Parmigiano Reggiano and dill then divide between shallow bowls. Top with the goat’s cheese and a grinding of black pepper and serve.